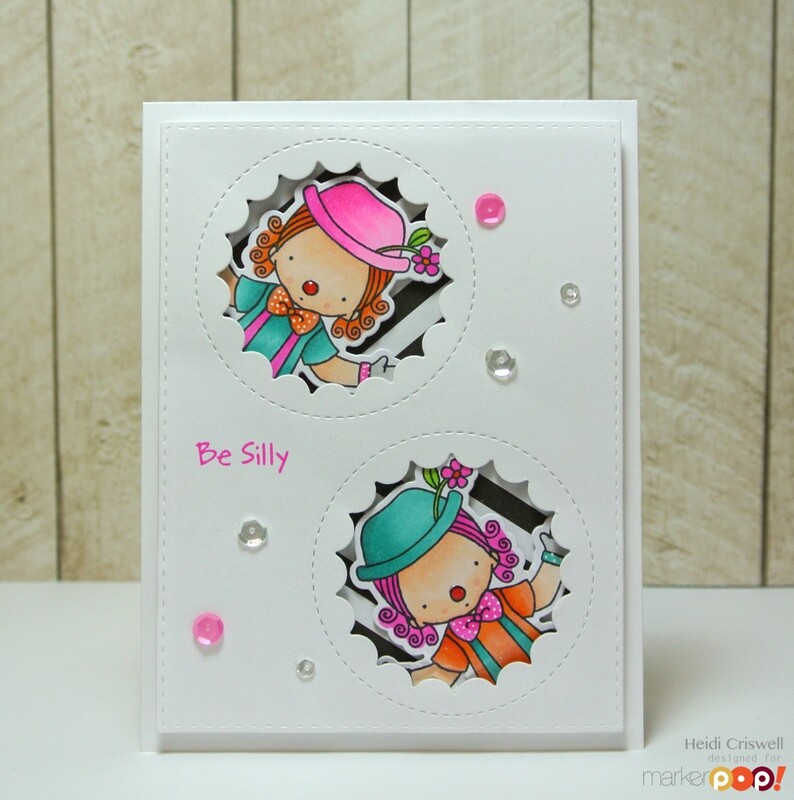 Hello everybody, welcome back to Crafty Time 4U, today I'm at the Marker POP blog, sharing with you a peekaboo card using My Favorite Things Stamps and Dienamics. The holidays are around the corner but I still have birthdays and other special occasions to go to and to make cards for, so today's card can be used for a birthday or encouragement for friend, child, or coworker. I think I mentioned before, that I really didn't like clowns so much, until this adorable "Pure Innocent" set came along. This is the most adorable clown I ever seen! Let me show you the card that I made and I will tell you a little bit more about it. For this card I used the "Pure Innocence Clowning Around" stamp and coordinated Dienamic set, the "Peek-a-boo circle Dienamics" and the stitched rectangle panel from the "Blueprints No.24"
I die cut and stamped the little clowns using "Memento Tuxedo Black" ink and them I colored them using Copic Markers. I used a blue-green, orange, and pink color palette, which I thought it was pretty fun for a cute little clown, and I added details on the bows, using a white gel pen . I used stripped black and white paper for the backgrounds inside the peek-a-boo windows. and to finish my card I applied some glossy accent to the clown's noses and I added few of my favorite Pretty Pink Posh Sequins on "Sparkling clear" and "Pink Peonies"
I hoped you enjoy this card, all the supplies are listed and linked below have a wonderful day! I love those peekaboo windows with the clowns peaking through! Adorable and so much fun!! Thanks so much Shannon! So Nice to hear you liked this card! I am LOVING your peek-a-boo windows cards! This one is just adorable and so much fun! Hi Heidi!!! 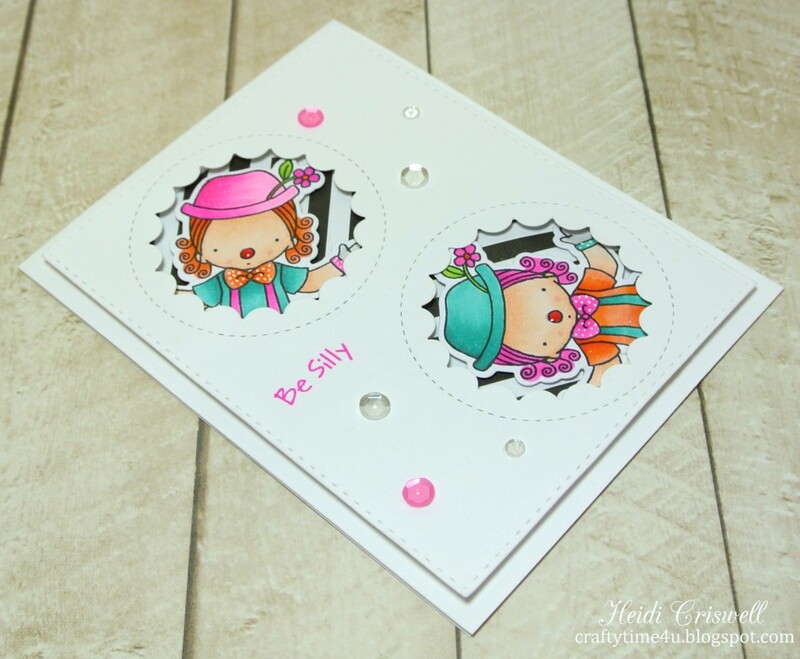 Your Peek a Boo card is super Duper CA-UTE my Friend! LOVE the Adorable Clowns and the Shape you used for them to pop through!! So FUN! :) Have A Great Weekend!